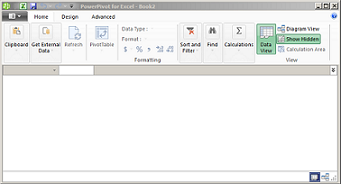 Power Pivot is an add-in that you can use to perform powerful data analysis in Excel. The add-in is built into certain versions of Office, but by default, it's not enabled. For a list of the versions of Office that include Power Pivot, as well as a list of the versions that do not, please see: Where is Power Pivot? Here’s how you enable Power Pivot before using it for the first time. Check the Microsoft Office Power Pivot box, and then click OK. If you have other versions of the Power Pivot add-in installed, those versions are also listed in the COM Add-ins list. Be sure to select the Power Pivot add-in for Excel. The ribbon now has a Power Pivot tab. This is the tab where you work with Power Pivot PivotTables, calculated fields, and key performance indicators (KPIs), and creating linked tables. Now you’re in the Power Pivot window. Here you can click Get External Data to use the Table Import Wizard to filter data as you add it to your file, create relationships between tables, enrich the data with calculations and expressions, and then use this data to create PivotTables and PivotCharts. In the Manage box, click Disabled Items > Go. Select Microsoft Office Power Pivot and then click Enable. If you have Excel 2013: HKEY_CURRENT_USER > Software > Microsoft > Office > 15.0 > User Settings.